Earlier this year, I did something I had always wanted to do: jumped on a plane with a just a pack on my back, and spent a single day exploring a new city. 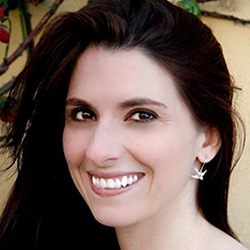 Being from Canada, where flights are long and expensive, this type of adventure held a certain charm – and as the mom of an almost-two-year old whose husband works long hours as a chef, I had earned the break. So, I set out to find a city I had never been to, close enough and inexpensive enough for a short trip. 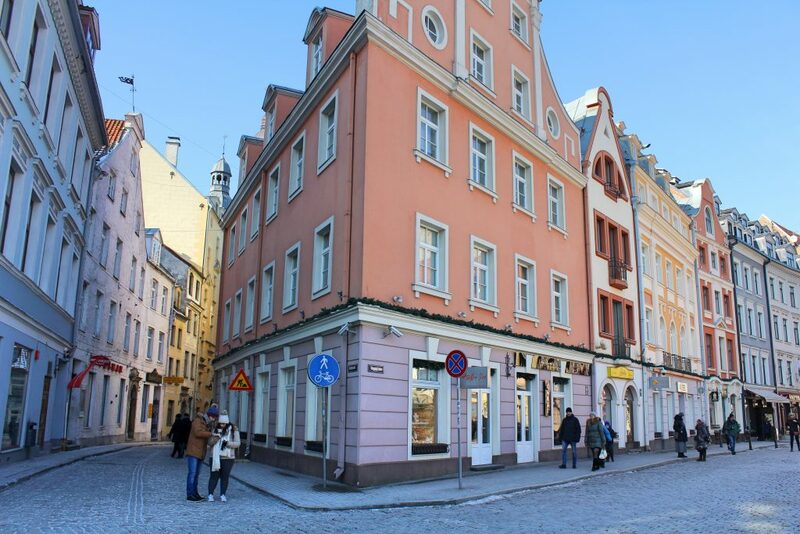 I found Riga, not just a new city, but a new country for me – Latvia was number 61 on my list! 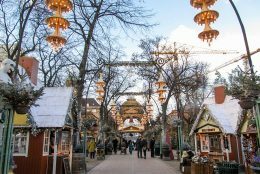 Only a short 90 minute flight from Copenhagen, with a charming and compact Old Town, Riga seemed like the perfect place. I found flights for 60€ return, and the highly-rated Treehouse Hostel, right in the centre and a bargain at only 12€ for a bed in a clean and comfortable six-bed dorm. Stepping off the plane in Riga, I headed for the bus to the city centre – the number 22 local bus or the number 222 minibus each cost only 2€. I caught the minibus, which is much faster, as there are limited stops, including two adjacent to the Old Town. I had planned to start my day at the famous House of the Blackheads, but somehow ended up missing my stop, which meant getting off the bus at the decidedly less picturesque bus station. But since I had spent so much time poring over the map of the Old Town, I knew exactly where to go! 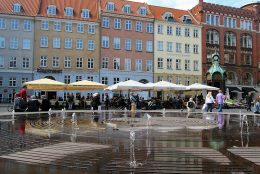 I crossed the bustling main thoroughfare and made my way in to the oasis of cobblestone streets. Realizing I was right near an amazing-sounding bakery, I decided to make that my first stop. 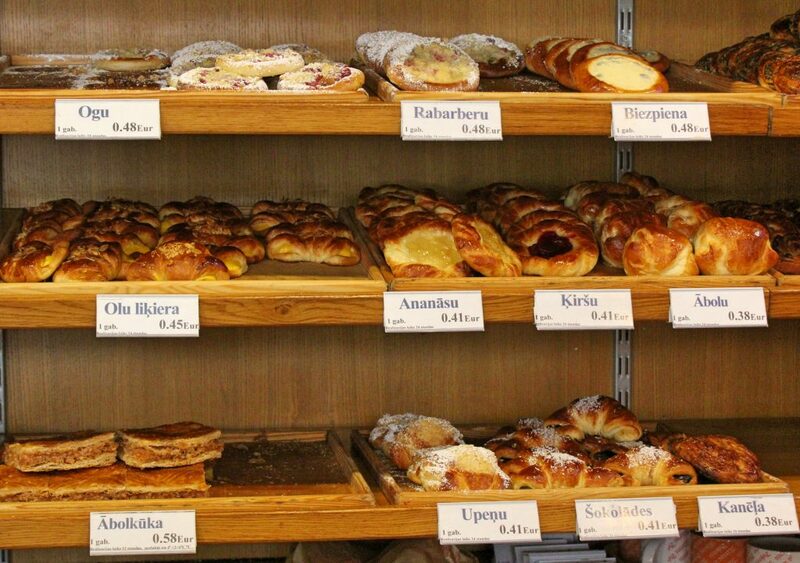 Martina Bekereja has a fantastic selection of cakes and pastries, at unreal prices – I bought a cherry Danish and a horn-shaped caramel pasty. Total cost: 0.79€, and they were both delicious! With pastry goodness in my belly, I was ready to start exploring. 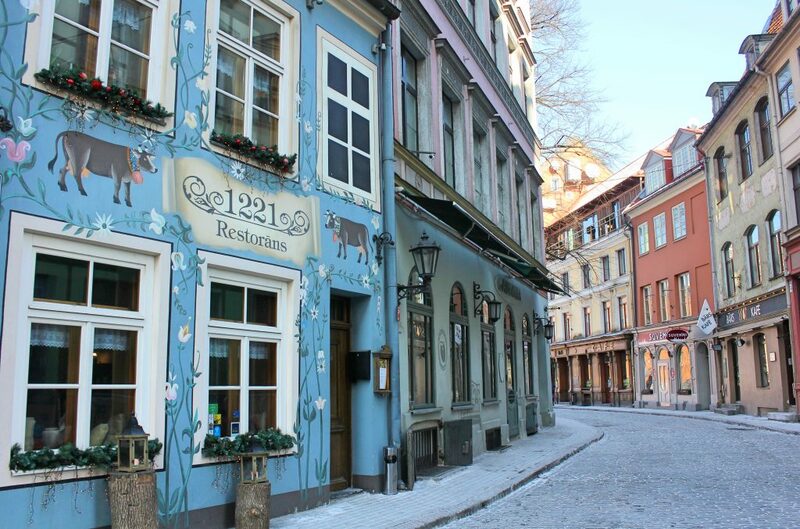 I made my way up Audeju Iela, dotted with shops and cafés in colourful historic buildings to the intricately detailed House of the Blackheads, probably the most recognizable sight in Riga. The original building was constructed in the 14th century for the Brotherhood of the Blackheads, a guild for unmarried German merchants. It was destroyed during the Second World War, but painstakingly recreated in the 1990s. At 9€, entry to the St Peter’s Church tower is not cheap, especially for an affordable city like Riga. But I decided the stunning views would be worth the cost, and I headed in. An elevator runs up the 130-metre tower every ten minutes. The viewing platform is small, but with sprawling views on each side, of the old town, the new city, and across the Daugava River to the very modern National Library. The church itself is beautiful inside, with ornate carvings and details. Tucked in behind the church is a charming little street called Skarnu Iela, where you can find a recreation of the Musicians of Bremen statue, gifted to Riga by the city of Bremen itself. It’s also where I had my lunch, at a lovely little spot called Petergailis. 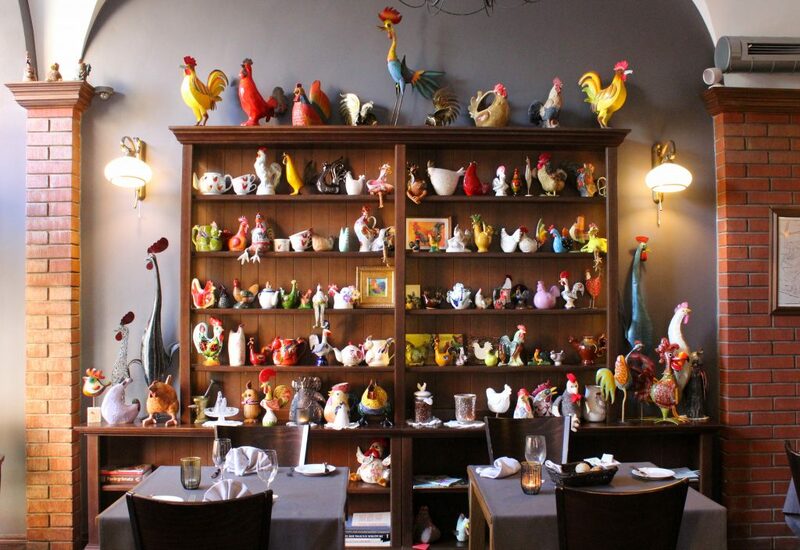 The small dining room features large windows with stained glass, and an impressive rooster collection. After a filling meal of beef cheeks and mashed potatoes, I headed back out into the cold but sunny day to wander the historic streets. In what seems to be a nameless square just at the foot of Tirgonu Iela, a series of tents showcased local handmade goods, from wood carvings to knits. The street itself is one of the most colourful in the city, with interestingly-shaped buildings in colours like coral and pale blue. It leads to Doma Square, overlooking by the imposing Riga Cathedral. Jauniela runs next to the church, where you’ll find picturesque buildings like the hand-painted Restaurant 1221 and the Art-Nouveau Hotel Neiburgs. 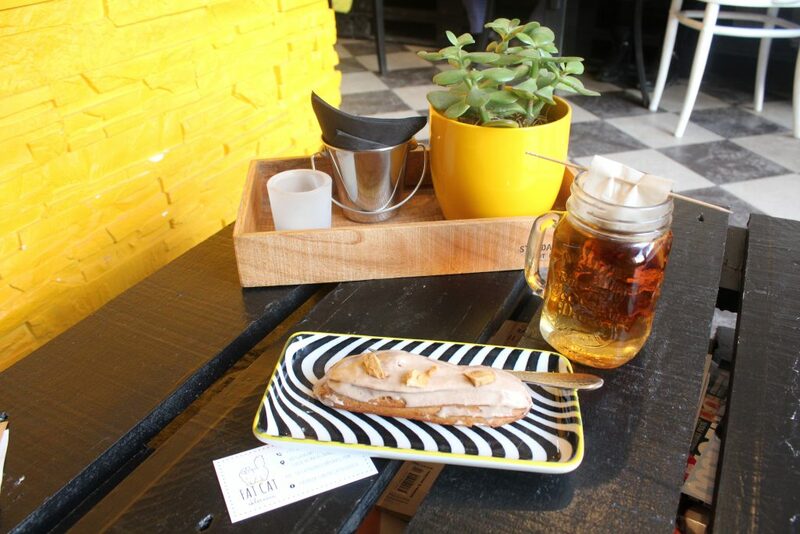 Just off Jauniela, I stopped to warm up at Fat Cat, a cozy little éclair spot. It was hard to choose just one éclair – they all looked incredible – but I went with apple cinnamon and a vanilla rooiboos tea. The éclair was delicious, and if I lived in Riga, this would definitely be one of my go-to spots. Wandering the northern part of the Old Town, I visited Riga Castle, home of the Latvian Prime Minister. The original castle dates from 1515 and now has both old and new sections. The castle has uniformed guards on duty. 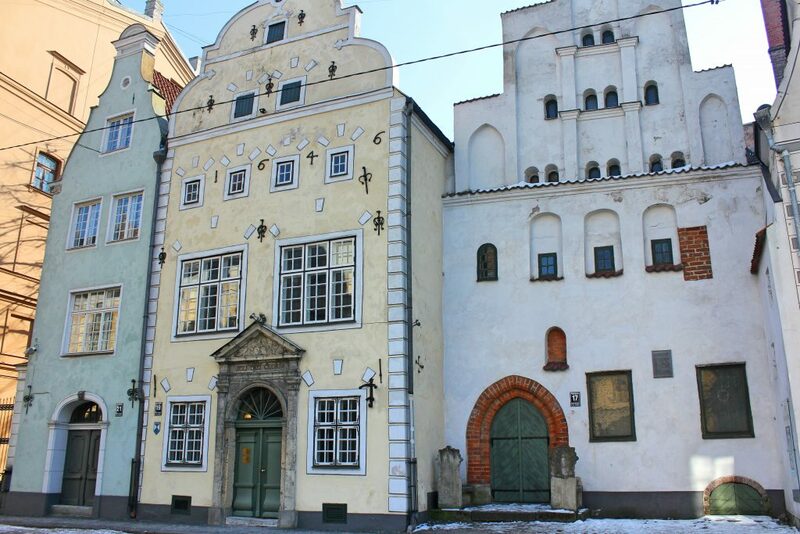 Nearby are Riga’s oldest dwellings, The Three Brothers, the oldest of which dates to the 15th century. Passing through the stone Swedish Gate, part of the old city walls and one of the last remnants of Sweden’s time in Riga, I reached Jacob’s Barracks, a pale yellow series of historic buildings which now house boutiques and cafés. The adjacent Powder Tower is now part of the Latvian War Museum, which is free to visit. But with not much time on my hands, I headed on. On nearby Meisteru Iela is the distinctive Cat House, an imposing building in a rich, deep yellow with forest green accents, and most famously, cat sculptures on the gables. 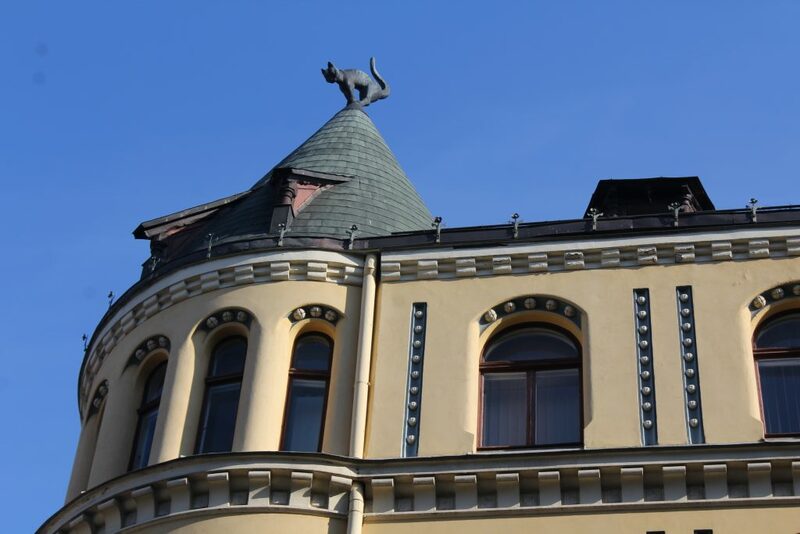 The Cat House is the reason behind the many black cat-themed souvenirs you can find in Riga today: the local legend says that house’s owner was denied admission to the nearby Riga Guild for merchants, so when he was building the house, he has the cat sculptures placed atop the residence with their rear ends facing the Guild building. After a dramatic court battle, he was finally granted admission and the cat bums were turned. Just steps away is colourful Livu Square, which I imagine in the warmer months is quite lively, but on this cold day was quietly picturesque. The sun was setting, and I was exhausted from my 4am wake-up, so I decided to spend my evening in a cozy, quiet spot where I could relax and soak up the local atmosphere. 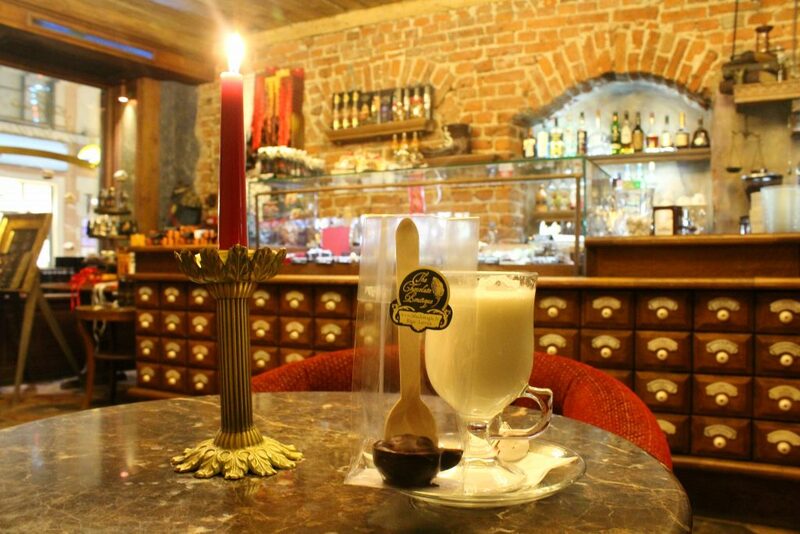 I headed to Riga’s Black Magic on nearby Kalku Iela: an intriguing mix of a bar and a chocolate shop with a Medieval theme, where you can sample Riga’s famous Black Balsam, a strong liquor made with 24 herbs and other ingredients. 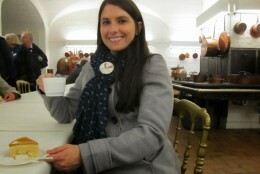 I opted instead for their acclaimed hot chocolate, a huge lump a dark chocolate that you dunk into your warm milk until it melts into gooey goodness. I pulled out my book, sunk into the comfy armchair, and read by candlelight sipping on the rich cocoa. I headed to my hostel, exhausted but content. In a fantastic location right on Livu Square, Treehouse Hostel is quiet, clean, comfortable and incredibly affordable. I had booked a bed in a 6-bed dorm for only 12€, and I ended up having it all to myself! It was the perfect spot to lay my head and prepare for day two of my Riga adventure. 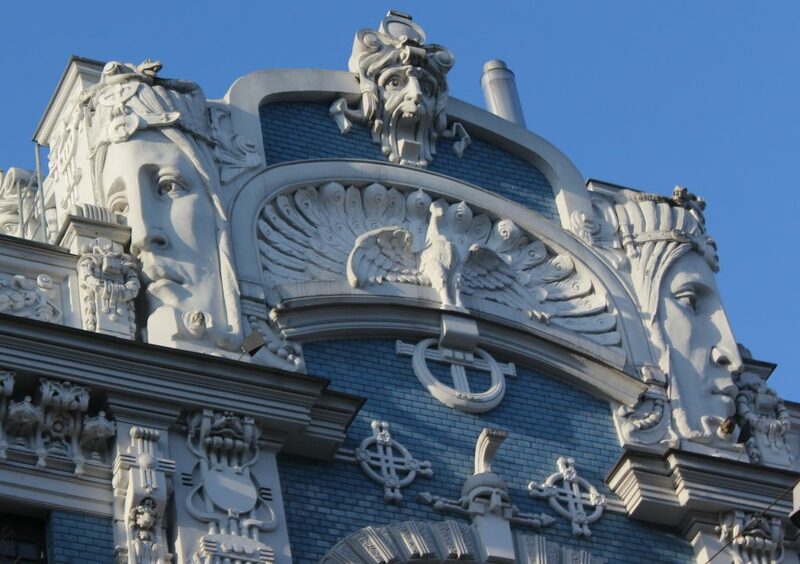 The following morning, I set out to see some of Riga’s stunning Art Nouveau architecture. I passed by the charmingly retro Laima Clock, erected in 1924 by Riga’s own Laima Chocolate brand, and the soaring Freedom Monument before strolling through the Esplanade park past the lovely Nativity of Christ Russian Orthodox Cathedral. The incredible buildings of Elisabetes Iela and Alberta Iela are the most renowned in Riga, and in the morning winter sunshine, they were especially beautiful. Intricately carved with impressive details, in a range of colours, I was awestruck by the beauty and history of these wonderful pieces of art. I jumped on the bus at the corner of the park to the Central Market – both the number 3 and the 11 run there. 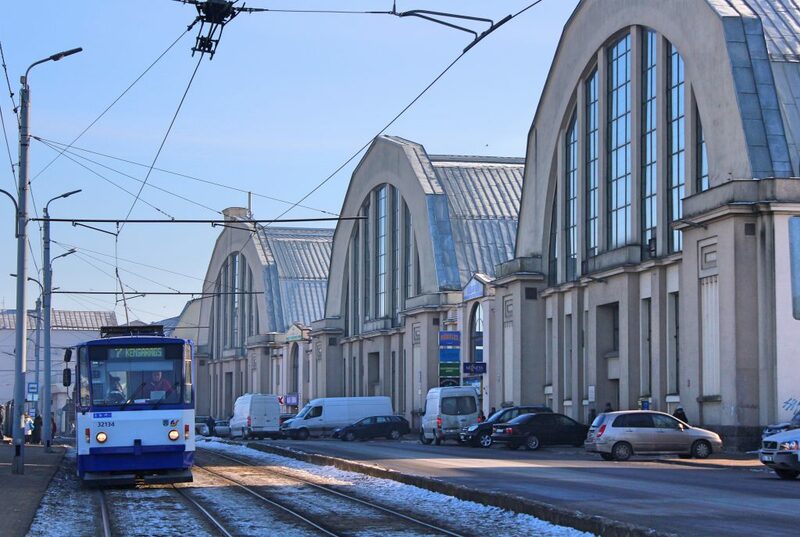 Riga’s Centraltirgus is the biggest market in Europe and is in a unique setting – four massive former Zeppelin hangers dating to 1930. The UNESCO-listed market contains 3000 stalls and has tens of thousands of visitors every day. 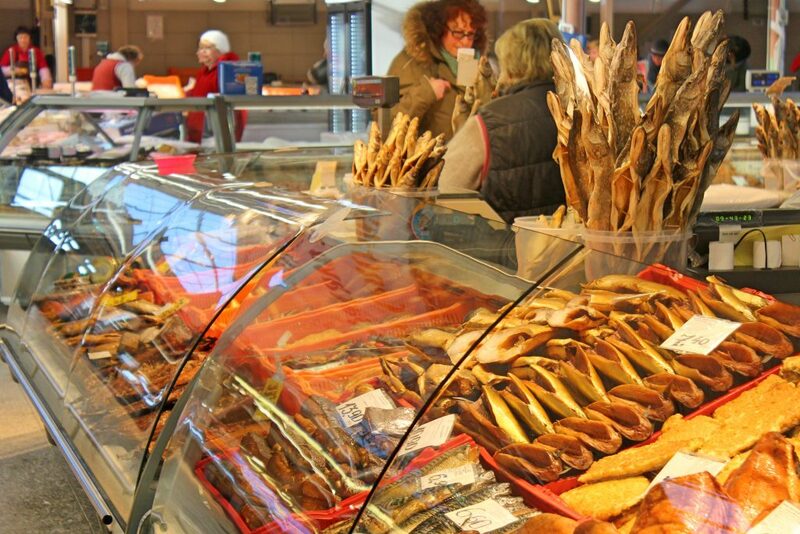 I browsed the meats, breads, produce, and more – the fish market was especially interesting, with its range of local products. I also bought a little souvenir for a good price from a very friendly local woman. But I didn’t spend as long at Central Market as I thought I would; though vast, for me it wasn’t as charming as other European markets, and I was put off by being shouted at by a man (not the vendor) for taking a photo of an outdoor fruit stall. 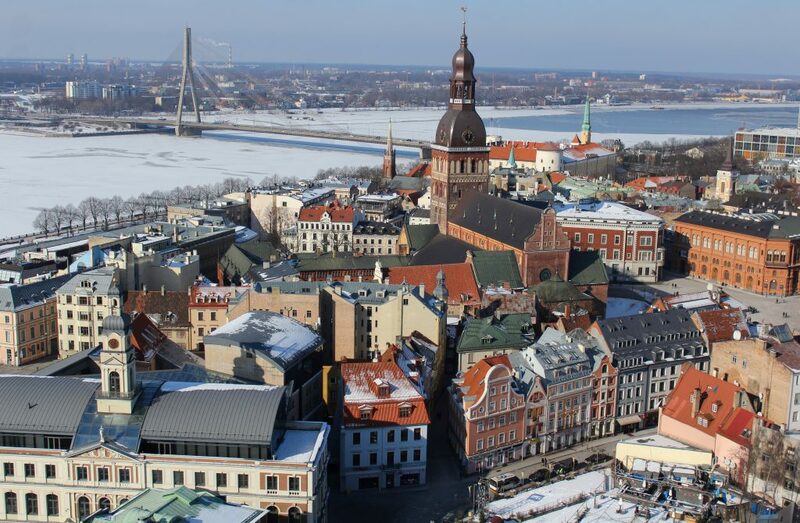 The Riga City Council has acknowledged issues within the market, including customer deceit and a homeless problem, which they are working to correct. In the mean time, be a little bit aware both in the market itself and the surrounding area, which is the local bus station. It certainly is an interesting place to visit nonetheless. I made my way back to the Old Town for one last stroll through the charming streets. Getting a little peckish, I stopped into Šefpavārs Vilhelms for a bite to eat. This basic but comfortable little spot has self-serve savoury and sweet pancakes for incredibly low prices – less 1€ each. I chose a meat and a potato with some sour cream and a cola, all for 3.50€. While maybe not the best pancakes I have ever had, they were tasty, filling, authentic and cheap. 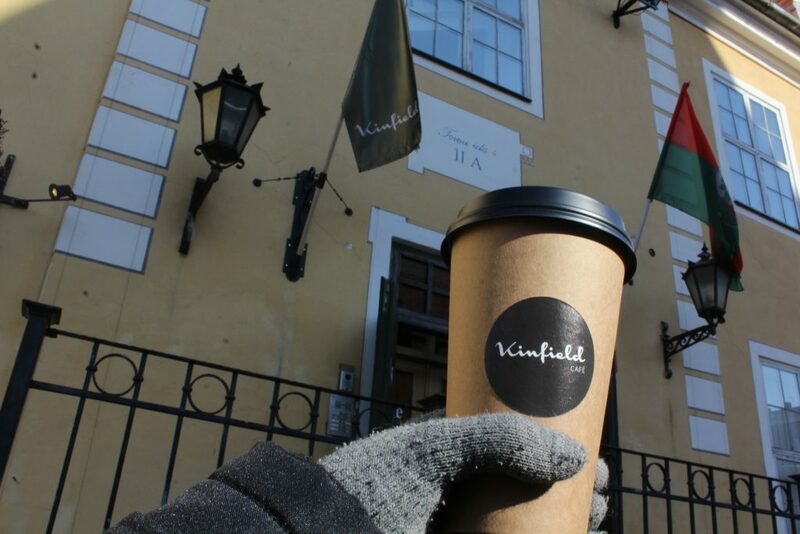 Continuing my stroll, I found myself at Jakob’s Barracks where I picked up a tasty hot chocolate at Kinfield, a coffee spot with a cozy, charming interior. I would have loved to sit in to warm up and soak up the atmosphere, but time was running short. 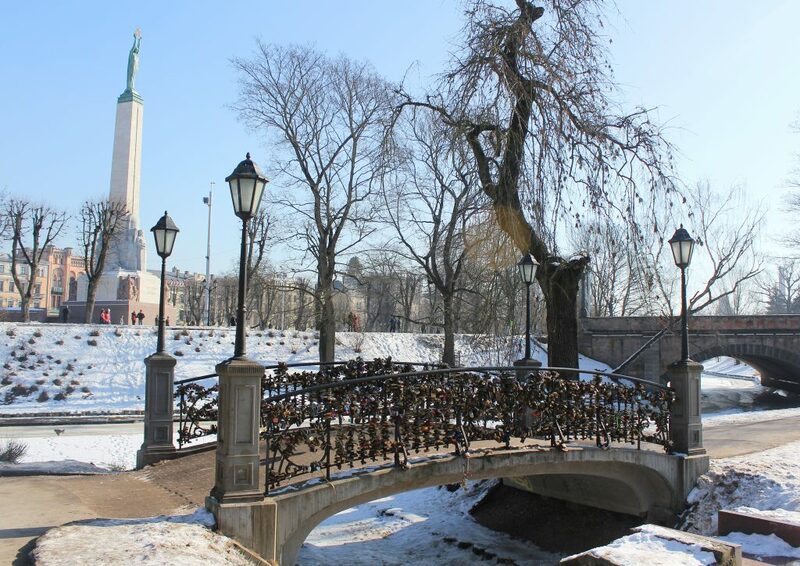 So I took my cocoa to nearby Bastion Hill Park, where I hiked up the Bastion, strolled along the river, and admired the small bridge covered in love locks. Then, it was time to go. In only 24 hours, I had experienced historic buildings, stunning views, bustling local life, quiet parks, tasty food, and the opportunity to just have some time for myself. It was an adventure, and just what I needed.